Stylish. Those who value style and design would not buy a rough-cut plastic brick to use on the desktop. Is the 15.6-inch MacBook Pro look-alike the right choice for the budget-conscious, yet style-seeking Windows user? 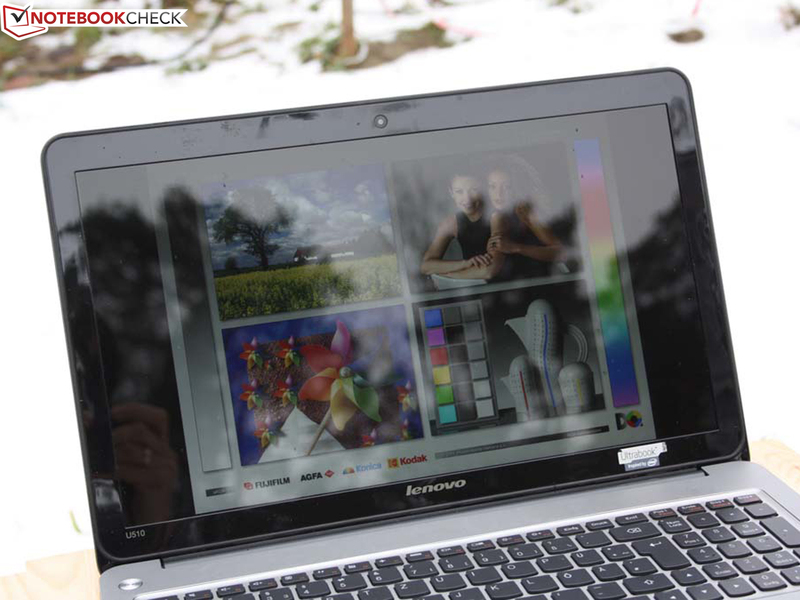 Lenovo IdeaPad U510: The Windows PC for the stylish user? 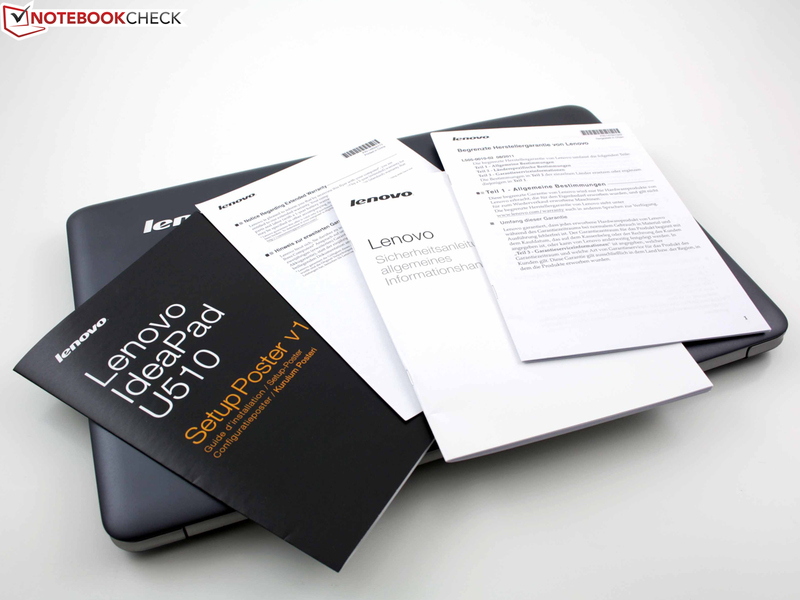 Lenovo describes its IdeaPad U510 in concise and simple terms; Affordable Windows 8 ultrabook. We are talking about a 15.6-inch ultrabook that leaves the handy 11.6- and 13.3-inch form factors far behind. 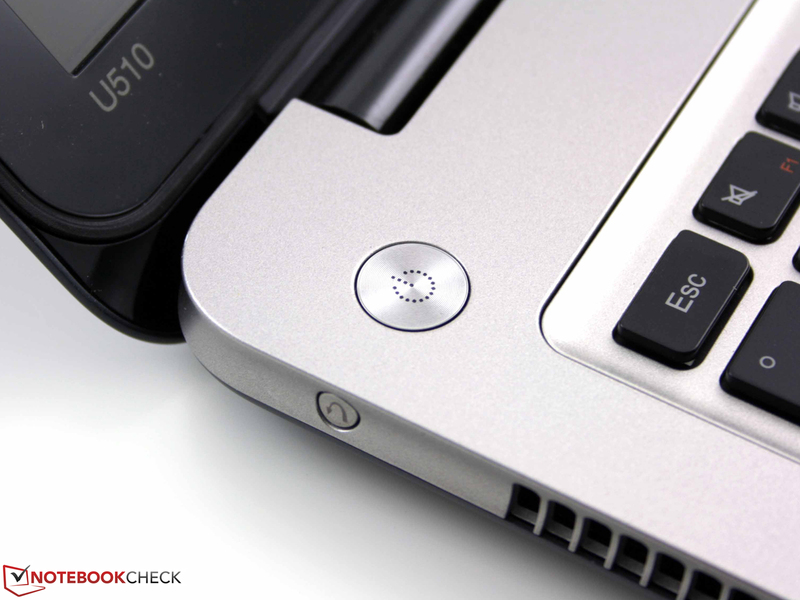 The manufacturer makes one thing clear with the U510: the bulky office laptops are a thing of the past. 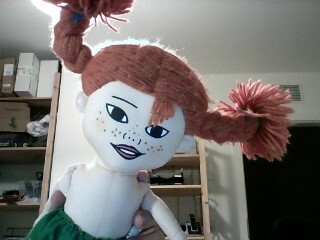 Browsing the web, working a bit, and enjoying multimedia content - all are possible with this beauty. For the price of 700 Euros (~$922) no outstanding performance should be expected of the Intel Core i3-3217U. The 15.6-inch form factor could attract those users for whom gaming and CPU benchmarks do not matter. The father wants a 15-inch notebook for typing and web browsing. The looks should be modern and resemble his Samsung smartphone. 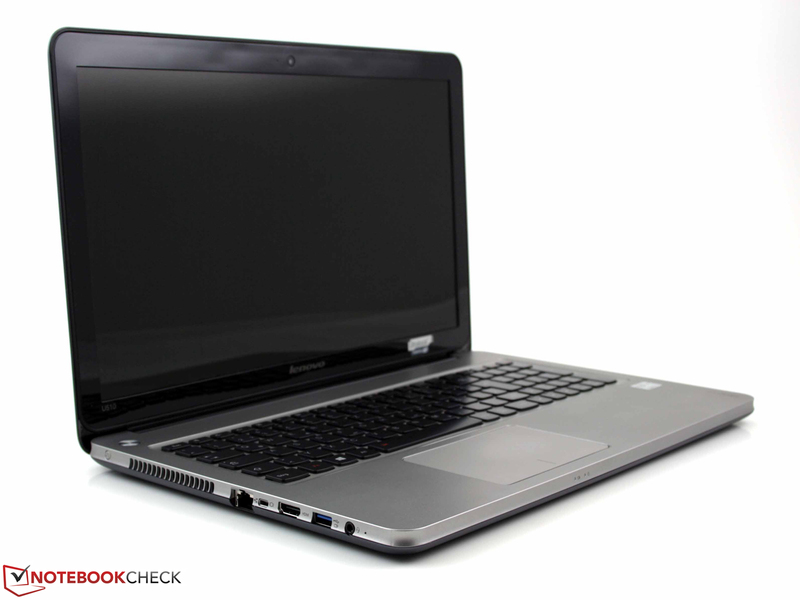 The low-cost HP Pavilion g6, Aspire E1-531, and the Lenovo N586 are also in this category. The aluminum finish grabs his attention, he sees the DVD drive and the battery life of 6 hours, and thinks to himself: I'll take it. Is this the perfect office notebook for the stylish user? 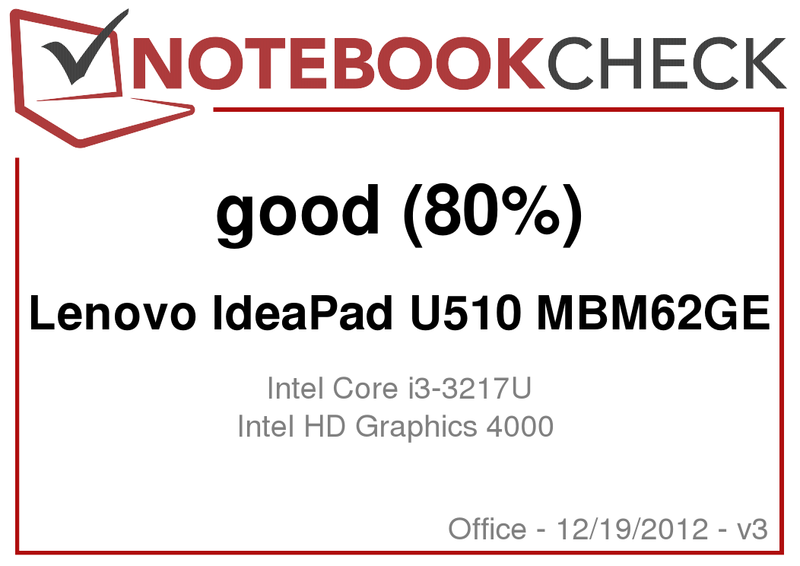 Our review of the Lenovo IdeaPad U510 holds all the answers and details. As equal rivals we have the following well built (made of aluminum or magnesium) and quite slim 14- and 15-inch notebooks, which have an optical drive as well. The U510 is slim and quite portable. 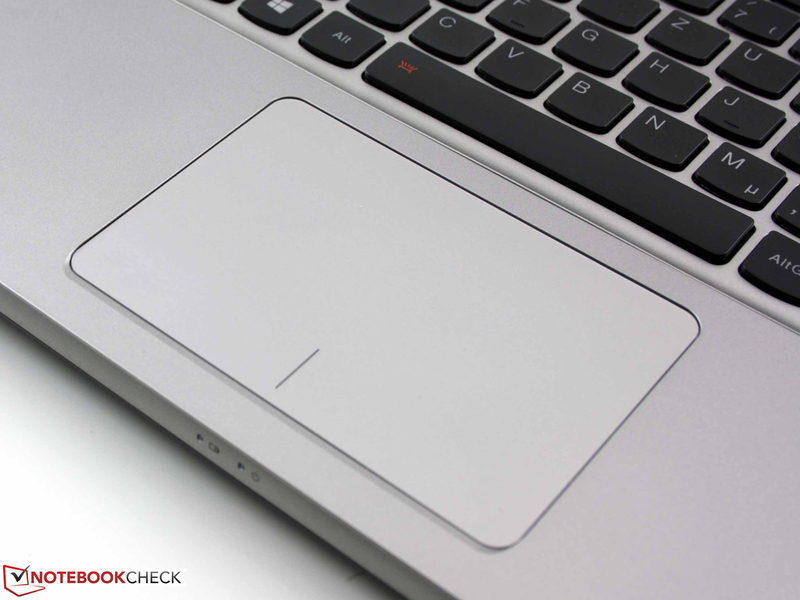 The required ultrabook height (21 mm/~0.83 inches for notebooks > 14-inches) is exceeded only by the rubber feet that raise the base by three millimeters (~0.12 inches). 24 mm (~0.94 inches) is the combined height. On the bottom side we find large intake vents, which should not be obstructed, even with the low-voltage Core i3 on board. The U510 is not in the modern shape of a wedge, but has a uniform height throughout. This does not diminish the practicality. In order to enhance the book resemblance and the lateral grip, the edges are curved inwards. This also eases opening the lid. The top and bottom sides look identical (no maintenance cover, perfectly flat surface) and are both made of lacquered aluminum panels. Because of that, the lid and the base should have gained stability and quality. We would like to leave it just to the latter, since the base is relatively flexible. The flat panel exhibits limited twisting when the notebook is lifted at a corner. The lid is no different and clearly gives in when depressed, especially when closed. We are not entirely impressed with the cold (metallic) feeling that the surface has. The large hinge has a soft, wobbly stop at about 140 degrees. The lid can be opened using only one hand, which does not cause the solid frame to bend or twist. The lid has a circumferential rubber lip that provides a smooth closing. Experienced enthusiasts can remove the bottom cover. 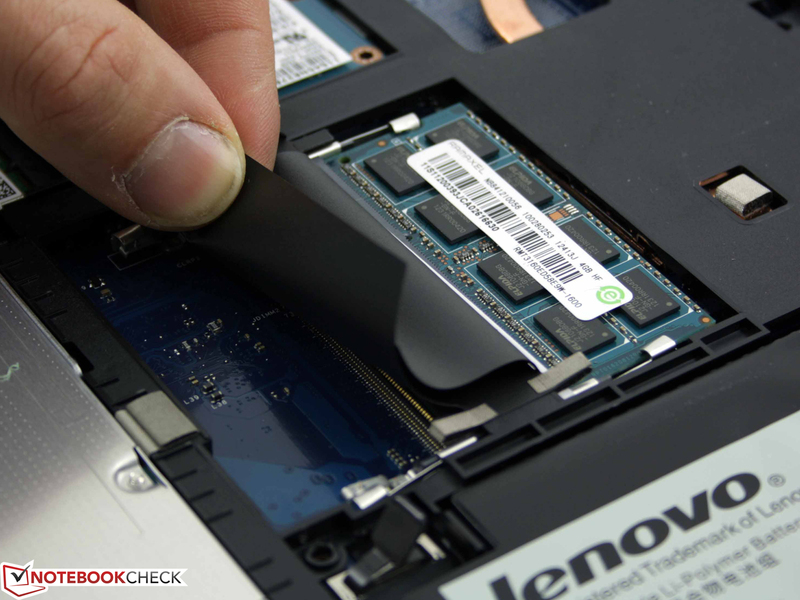 Lenovo's Maintenance Manual U510 shows the process in detail, but changing the hard drive or the RAM modules should best be left to the experts. Removing the keyboard causes the first scratches on the lacquered plastic palm rest. There are four screws under the keyboard. This leaves four more screws beneath the feet and a couple of fragile plastic latches on the front. Two of the latter broke completely. The images on the right show the inside of the U510 in detail. Slim chassis that looks like a book (24 mm). The "sides" are curved inwards. A key characteristic of the U510 is its DVD drive. Unfortunately Lenovo has not used a Slot-In-Drive, but a conventional tray drive. The former would definitely have looked better stylistically and the stability of the chassis would have been better. Slim 14- and 15-inch ultrabooks are no longer scarce. For example: HP Envy m6-1101sg (760 Euros, ~$1010), Aspire V5-431 (from 400 Euros, ~$531), Aspire TimelineU M3-581TG (i5, GT 640M, 870 Euros, ~$1156) or Medion's Akoya S4216 (Multi-Bay with battery/DVD). The manufacturer has installed an Ethernet RJ45 port, but not a standard VGA port. The latter is replaced by a Mini-VGA, but an adapter is not included. Acer has done things differently with the Aspire V5-431: the supplied dongle (RJ45/VGA) provides both ports. U510 can connect to the Internet via WLAN (Centrino Wireless-N 2230) or via Fast Ethernet. Lenovo has omitted Gigabit LAN. This makes moving your film collection quite annoying, especially if you have to transfer hundreds of gigabytes from the PC to the laptop via WLAN. Perhaps the user has a Gigabit switch, which will now go unchallenged. 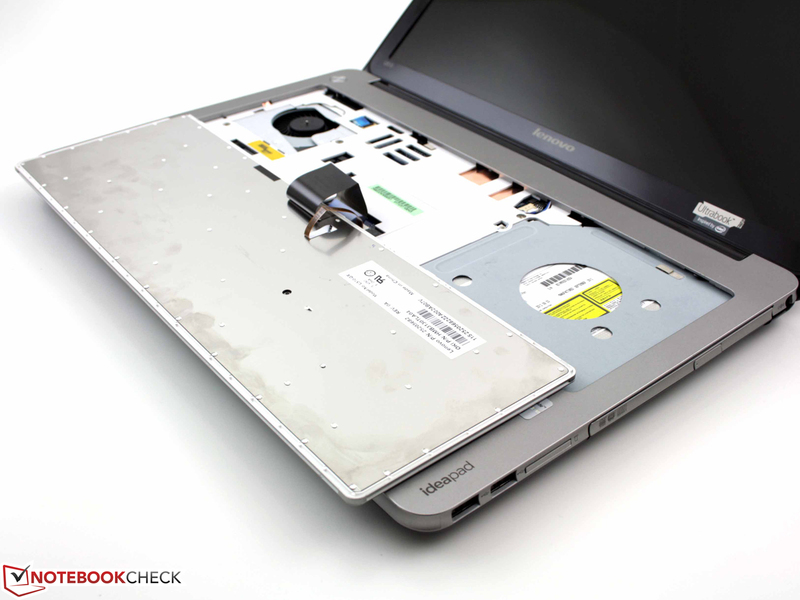 We cannot understand Lenovo's choice - every common notebook has a Gigabit Ethernet chip. Is the reception of the wireless adapter any good? Yes, it is, but only over short distances. The reception is excellent at three and ten meters (~10 and 33 feet, second floor). Outside the house, it dropped down to two bars (15 m, 49 feet) and at 40 meters (~131 feet), the signal was completely lost. Those are weak results. An Intel Centrino Advanced-N 6205 (a/b/g/n) had two bars at the furthest distance. 50% of the transmission power of the router (Fritz!Box 7270) is lost along the way. The webcam has a resolution of 1280x720 pixels. The photos seem bright enough, but have a significant amount of noise and the colors look unnaturally cool. The U510 comes with a pre-installed Windows 8 (64-bit). There is no Free DOS model, unlike the IdeaPad S300/S400. No recovery disks are supplied either. The user can burn such a disk via the OneKey Recovery. The Recovery Mode on the hidden HDD partition is called upon by pressing the OneKey button. This functions even if the computer is turned off. This key also activates a simple BIOS, in which the F-keys' function can be changed (deactivation of the hotkey mode). There is also no mini-VGA-to-VGA adapter. We are not talking about the popular Mini-DisplayPort-to-VGA cable, but the rare Mini-VGA one (Manual: VITU5 MINI-VGA CABLE). For example, such cables are the HP-Mini-VGA-Cable (FY828AA) and the Asus Adapter Kit Mini-VGA-to-VGA (30 Euros/~$40). 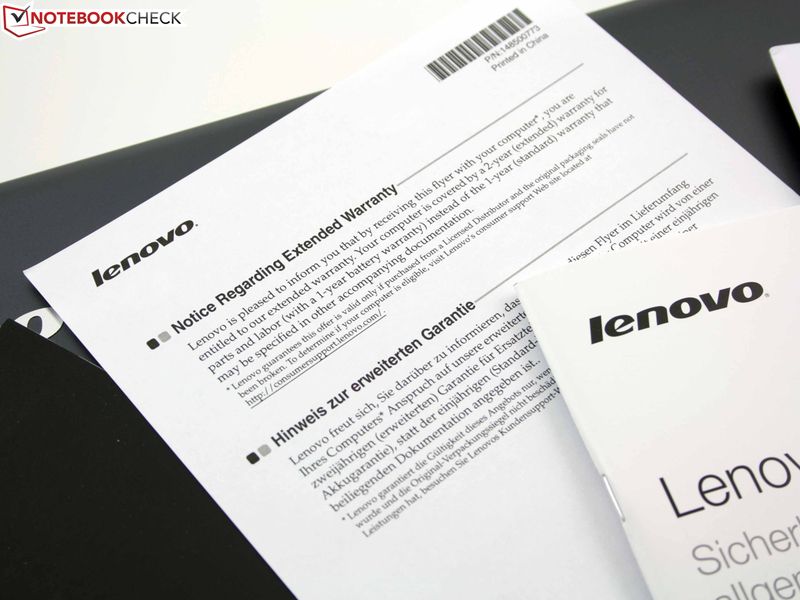 Lenovo supplies the U510 with a 24-month Bring-in warranty. In the box we also find an information pamphlet, which explains what is covered. But what warranty updates are available for my Lenovo? 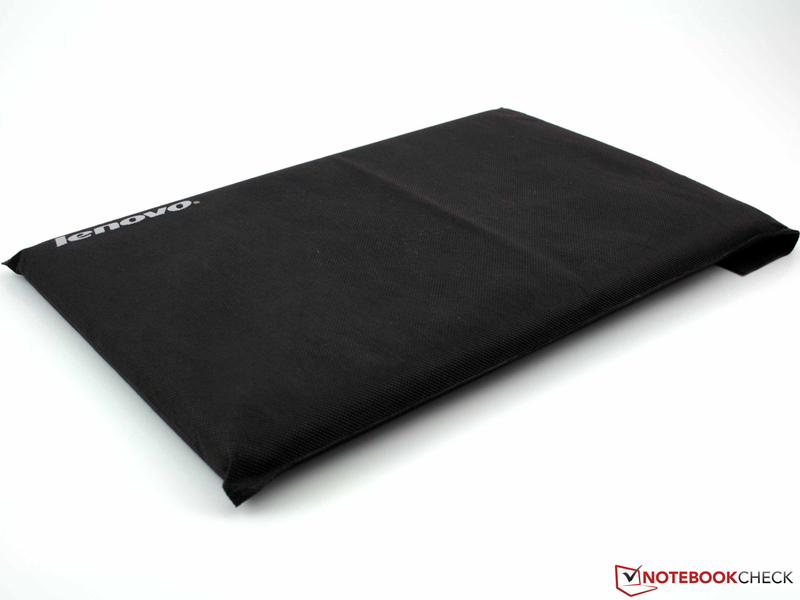 You can find out by entering the serial number of the notebook on the manufacturer's service website. The flat chiclet-type keys lie in a small recess in the base unit. The user might need to get used to the small Enter and Backspace, as well as the indented arrow keys. Once accustomed, the user could work comfortably, thanks to the good key spacing and the numeric keypad. "Could" – the soft base inhibits a firm key stop and the vague pressure point takes away the last bit of feedback. The medium drop does not compensate for the above. The large ClickPad (12.5 cm/~4.9 inches in diagonal) could have been very good, if it had a reasonable key drop. We are tortured by a short key travel, while the required force to press the key is relatively high. The touchpad registers a click only at the very bottom, while in the middle (left mouse button) it does not. Overall, mouse movement with the Multi-Touch-Pad feels good. The smooth surface has little friction and rarely slows down finger movement. 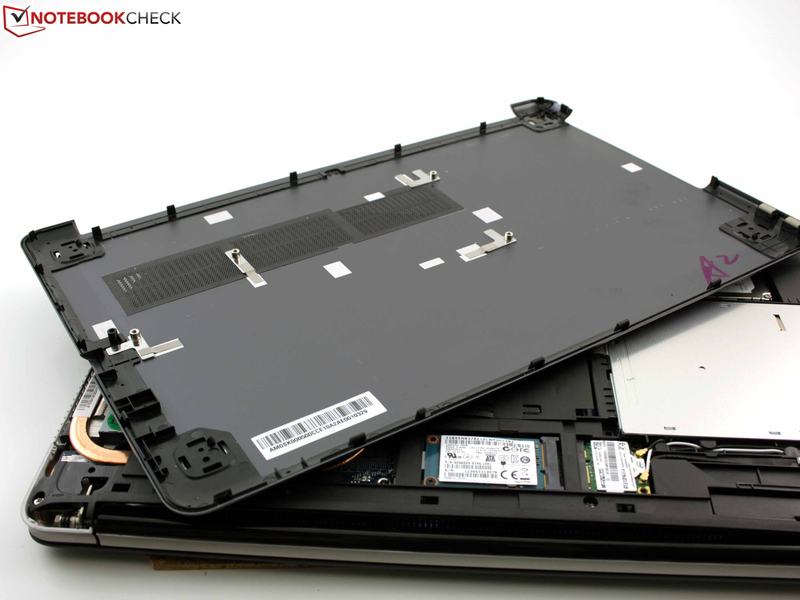 The non-matte surface of the 15.6-inch panel (16:9; 1366x768) is a common characteristic of all the IdeaPad notebooks. 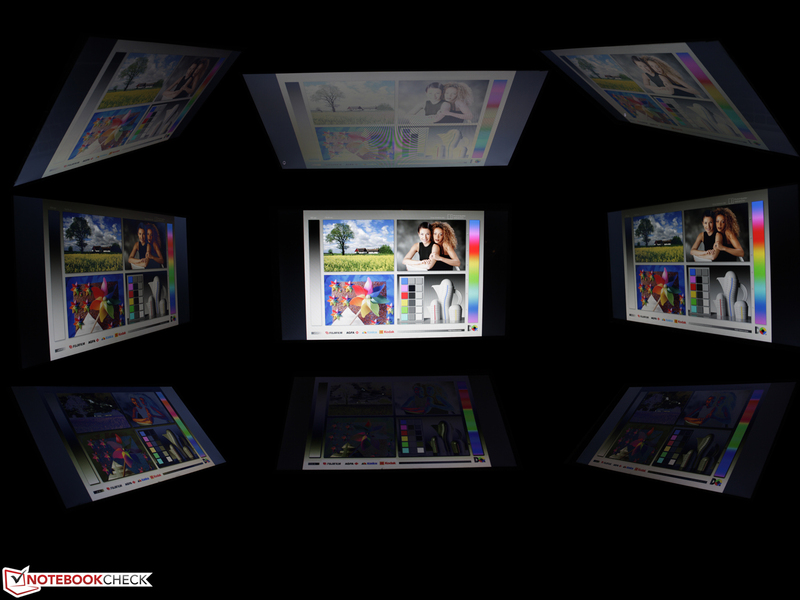 There is not a single model without a glossy display! 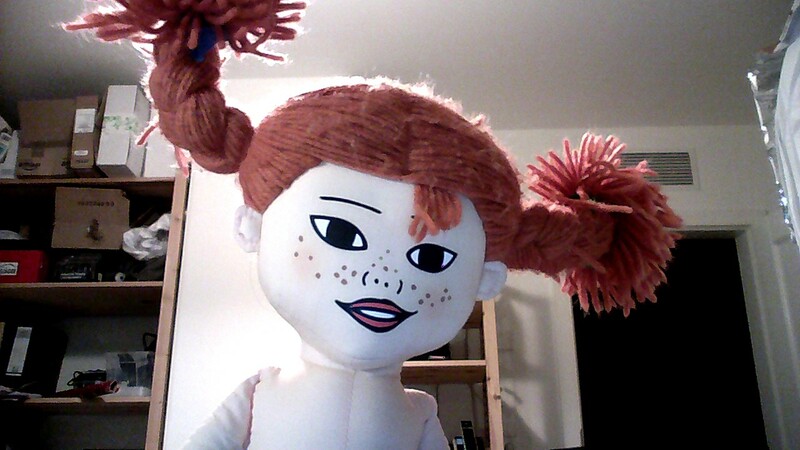 This could scare away some buyers. In the class under 800 Euros (~$1063), panels such as our AUO B156XTN03 are relatively common. 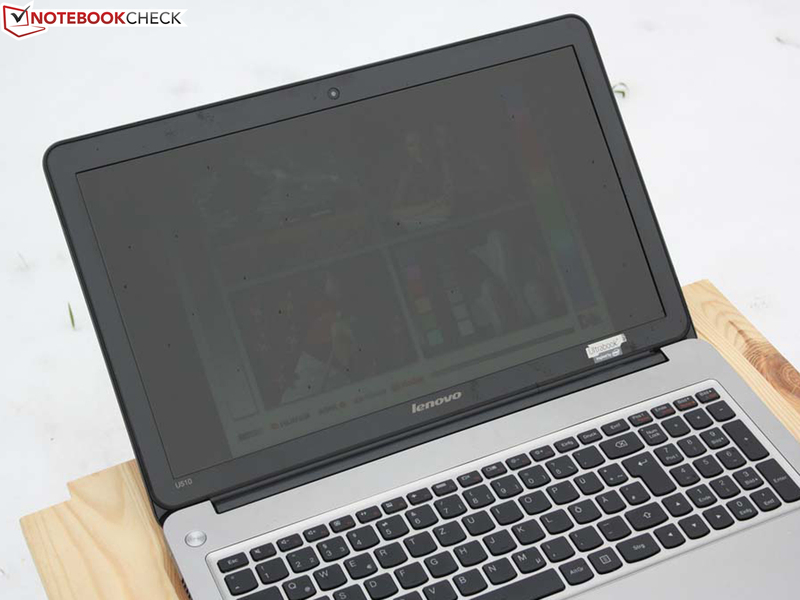 Low-cost devices like the HP 650 or the Lenovo Edge E330 prove that the matte panel is not a matter of price range. We have to admit: the glossy display is not the worst choice. The combination of a high contrast ratio of 611:1, bright colors, and deep black works quite well. A better color reproduction is important to professional image editors, who would also be disappointed by the HD resolution of the 15-inch display. Therefore, we list the following only for the purpose of completeness: sRGB and Adobe RGB were clearly not covered. Low black level (0.319 cd/m²) and large color space reproduction do not always go hand in hand. Even premium notebooks like the Asus Zenbook UX51VZ do not necessarily cover the sRGB color space. None of the mentioned rivals manages to completely cover sRGB. The reflective surface and the low brightness, averaging 189 cd/m², make the U510 unsuitable for outdoor usage. Effective work is hindered by the reflections and the too dark desktop. The photos below were taken on a cloudy day. Even under these ideal conditions, the desktop was still mostly too dark. In order to be sufficiently readable in daylight, the luminance of a reflective type panel should be a minimum of 300 cd/m². The viewing angles are typical for an affordable notebook - very small. Massive inversions occur even at the slightest change (10 degrees) upwards or downwards. The cause is of course the TN (Twisted Nematics) panel with white LED backlight. The U510 has a horizontal viewing angle of 45 degrees (see the picture below). The U510 has a rich variety of configurations. Starting from the entry-level model with Core i3 3217U and HD 4000 (our unit) up to the top model with Core i7 3517U and GeForce GT 625M. The GeForce graphics chip is standard for every model with i5 and i7 and should be preferred by gamers. We'll take a closer look at that in the Gaming section. The HDD options are only 500 and 750 GB. Although there is no SSD available, all the HDDs have a 24 GB SSD cache. 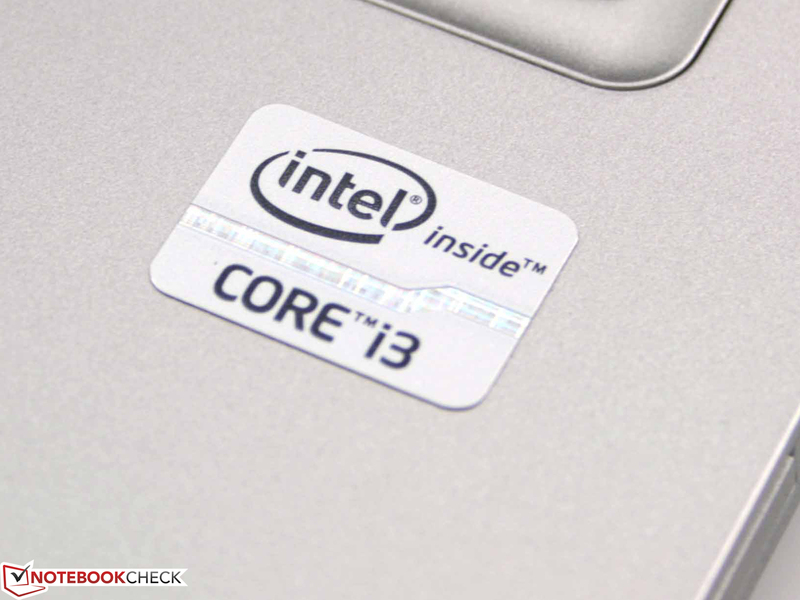 Starting with the name, the Core i3 already suggest a lower performance than an i5 or i7. But how large are differences? Should buyers stay away from the i3? Using the Cinebench tests we will examine the difference in performance. The CPU multi-core test (1.71 points) results are 36 to 41% worse than the i5-3317U (Asus S56CM, VivoBook S400CA). The Core i5 benefits from Turbo Boost. If you think that is not a significant difference, the OpenGL test shows impressive results for all the rivals. The dedicated graphics chips Radeon HD 7670M (Envy m6-1101sg), GeForce GT 640M (Aspire M5, Aspire M3) and GeForce GT 635M (Asus S56CM) provide an increase in performance of up to 186%. But gamers have a choice: the GT 620M, which comes with the i5 and i7 models of the U510, was 123 and 117% faster in Aspire V5-571G and in Asus UX32VD (i5-3317U) respectively. 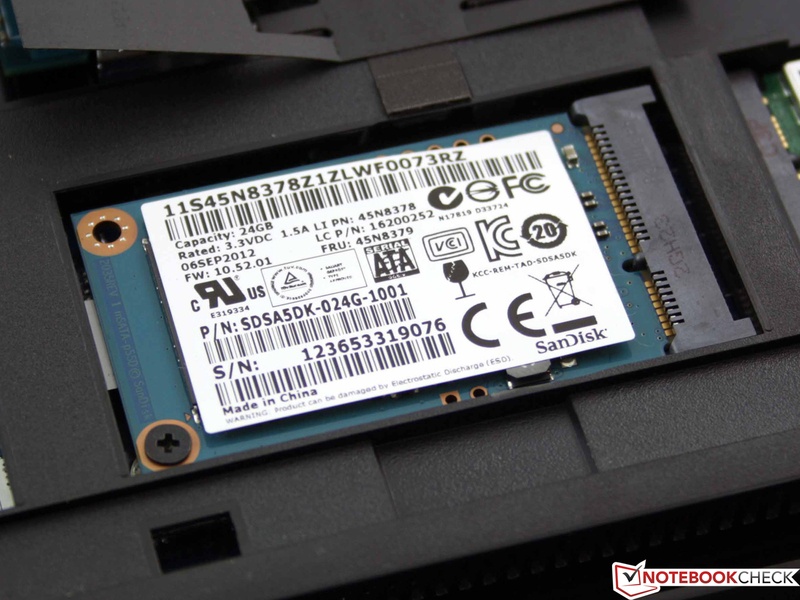 Thus, the GT 620M is not the best choice in terms of performance. The Cinebench R11.5 Single test (1.11 points) utilizes only one core. Here 1.8 GHz are not enough - thanks to Turbo Boost, i5-3317U (+37 %) and i7-2637M (+45 %) are faster. 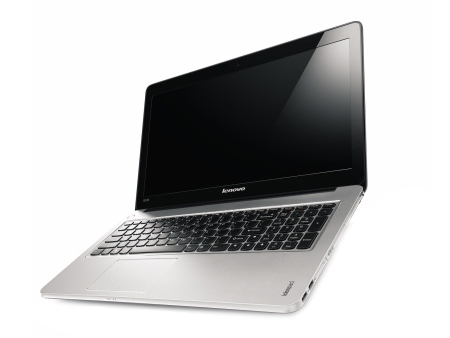 The latter processor is not available with our notebook, but Lenovo offers the i7-3517U instead. In the Dell XPS 13 it was 64% faster than the Core i3. On battery power we measured identical results as when plugged in (CPU and GPU @Cinebench R11.5). The result of the PCMark 7 is 5307 points. 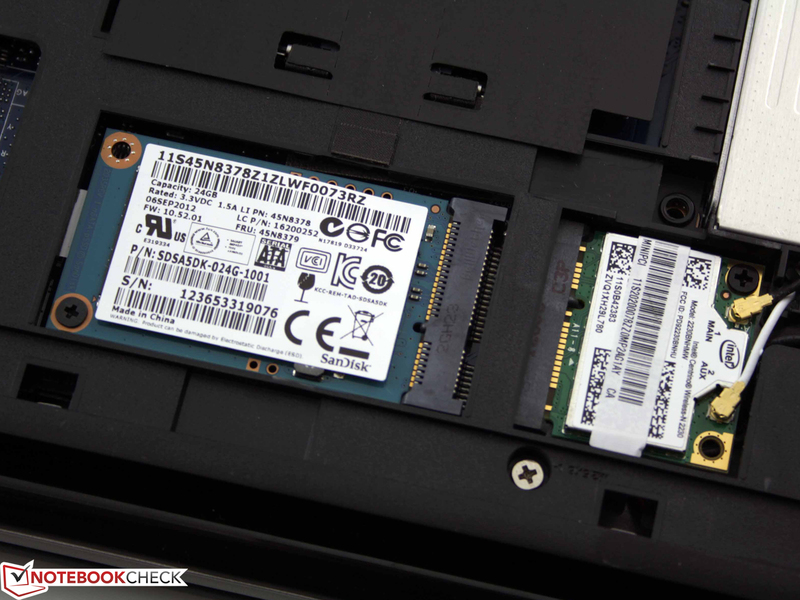 Ultrabooks with i5 3317U can be up to 33% faster, depending on the speed of the SSD/HDD; then come the true SSDs, such as the one in the Aspire M3-581TG. It seems that the Core i5 ultrabooks hardly benefit from their faster graphics cards. Even HP Envy m6-1101sg, which performed very well in the OpenGL test, is now 9% slower. The cause lies in the slow hard drives. On the other side is the Aspire M3-581TG. 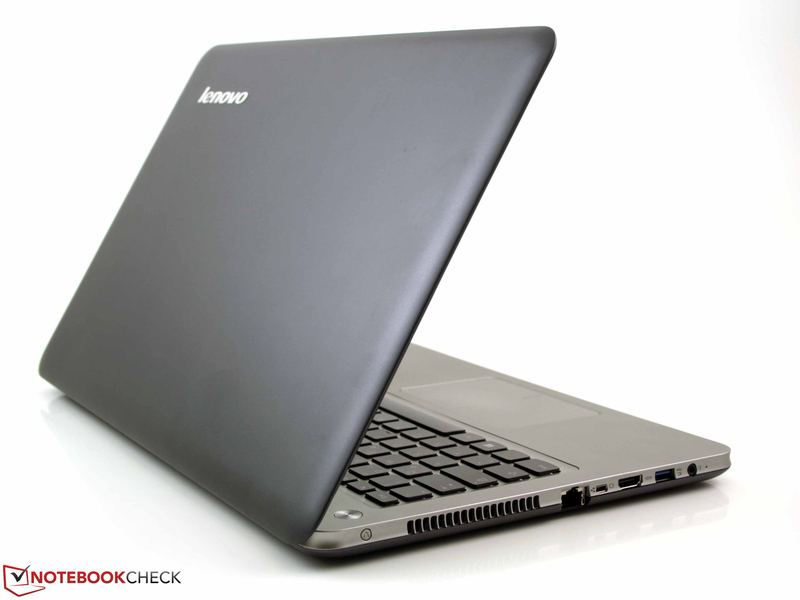 It scores very high thanks to the quick access times of its Lite-On LMT-256M3M SSD. HDTune showed an average of 97 MB/s – a good result for a 5400 RPM hard drive. CrystalDiskMark measured 98 MB/s. The HDD scores of PCMark Vantage and PCMark 7 hardly benefited from the throughput. The results are far from the 4500 points (PCMark Vantage HDD score) that a quick 5400 RPM HDD can achieve. The storage score in the PCMark 7 is 2181 points - average for a 5400 RPM HDD. The Momentus Thin reads small data very slowly (4K Read 0.35 MB/s CrystalDiskMark). Many of the common 2.5-inch HDDs are up to 100% faster (5400 RPM). You can find more comparative data in the HDD/SSD Benchmark list in the FAQ section. The SanDisk U100 SSD (24 GB) functions only as cache for the HDD. It is unusable by the user and its memory stores frequently used data. This speeds up applications and system start-up. In turbo mode, the HD 4000 is overclocked (1000 MHz) and at idle it is downclocked (350 MHz). The 3DMark 06 score is 3504 points - in the lower range for this graphics chip. The reason is not only the CPU dependence of the benchmark (i3 is relatively weak), but mainly the shared Single Channel DDR3 memory. As expected, the rivals with dedicated graphic cards achieve higher results: Asus S56CM (+113%), Aspire M3-581TG (+162%), Aspire M5-581TG (+180%), HP Envy m6-1101sg (+126%). The GT620M alternative (+192%) is also significantly faster (Aspire V5-571G). The results of the 3DMark 06 indicate how games should run. Performance is at a low level - users should not get too excited about it. Some relief may come from the possibility to upgrade the RAM (~25% increase). The two slots allow Dual Channel RAM to be at the disposal of the GPU. Still, the graphics card barely suffices for gaming purposes. Games run smoothly with minimum details and low resolutions at the most. Gamers would be better off with a GeForce GT 620M, GT 640M, GT 635M or HD 7670M. Unfortunately Lenovo offers only the weakest of those. This is rare: the fan is barely audible under full load. The base remains cool. The U510 surprises: no matter how much we torture the notebook, it never gets louder than 33 dB (A). Strangely, the optical drive completely kills the silence of the fan with a loud roar - we measured 43 dB (A) when playing a DVD. On the other hand, the hard drive is as quiet as the fan, never exceeding 30.6 dB (A). The fan never completely turns off. For the full load test we ran Prime95 (CPU) and FurMark (HD 4000) simultaneously for two hours. This increased the noise level only to 33 dB (A). None of the rivals is this quiet under full stress (40-48 dB (A)). Quietest is the Aspire TimelineUltra M5-581TG (GT 640M) at 42 dB (A). The U510 remains reasonably cool. At idle and with sporadic load (office use) the base and the palm rest are lukewarm to warm. At no point is the 35 oC (95 oF) mark exceeded. Under constant load the temperatures rise to 38 oC (100.4 oF). In this case (stress test for several hours), the CPU steadily runs at the default clock of 1.8 GHz. During the pure CPU stress test with Prime95 the clock frequency was the same. The 3DMark 06 test we ran immediately afterwards showed the same result as before. (±) The average temperature for the upper side under maximal load is 32.5 °C / 91 F, compared to the average of 29.4 °C / 85 F for the devices in the class Office. Where are the speakers? The music seems to be coming out of the area of the hinge, thus we believe they are located above the keyboard. Opening the case proves us right. The small speakers are suspended in a movable rubber buffer. Thus the membrane can vibrate better. The result is a sound that is acoustically similar to a high-end multimedia notebook or a MacBook Pro. There are no distortions at high volume and the highs and mids are clear and distinct. The bass is largely lacking. 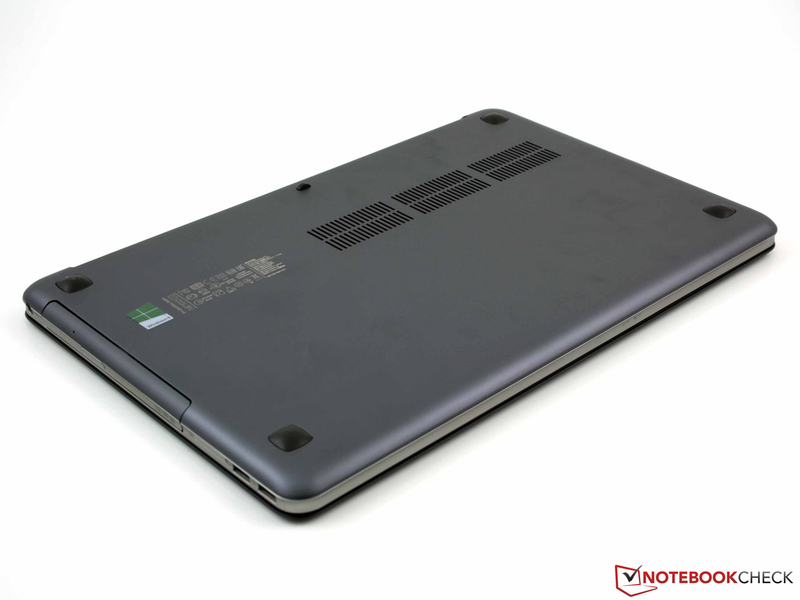 Even though multimedia laptops have a separate subwoofer, we are happy with the sound of the notebook for this price range and its slim case. 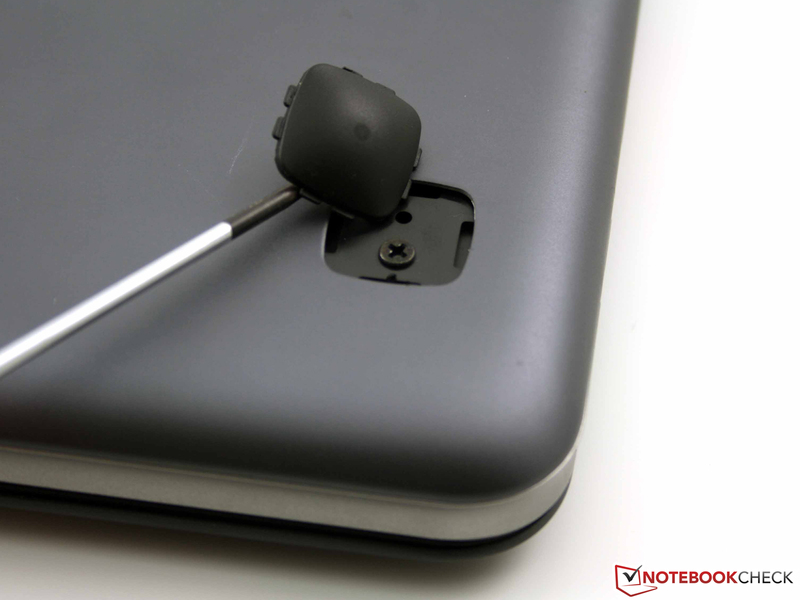 Music enthusiasts can connect headphones or external speakers via the analog headphone/microphone combo jack. The position of the speakers has a clear advantage over devices with speakers under the palm rest (requires a desk) or above the keyboard. The lack of a desk, covering the speakers, or closing the notebook has no effect on the sound. The battery life at idle of almost 8 hours (lowest brightness, energy-saving profile) is surprising. 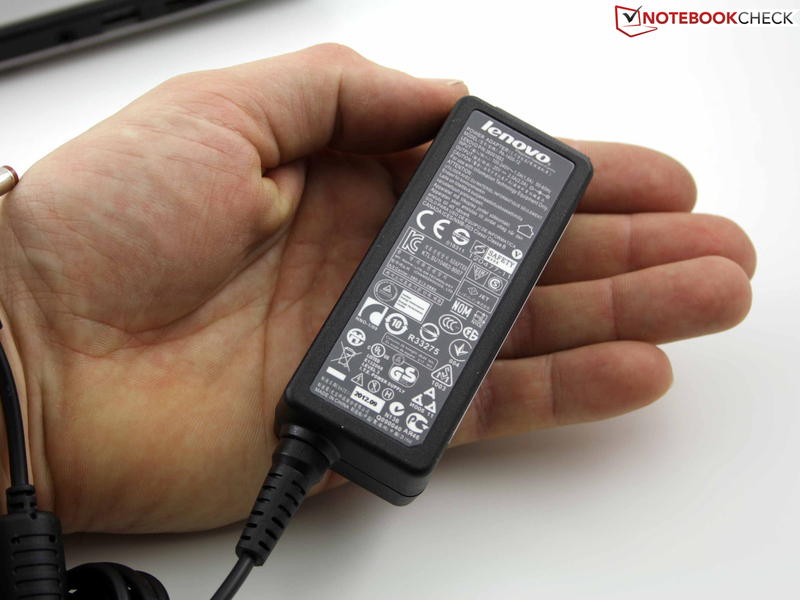 Not because it is a good run time for an ultrabook, but because it is equipped with a meager 45 Wh battery. The low energy consumption of less than 7 W (minimum) and 12 W (idle, maximum) provide the U510 with a good battery life. The rivals with the same form factor have similar energy consumption at idle, but higher consumption under load (idle/stress test), because of the dedicated graphics cards: Asus S56CM (GT 635M, 7/60 W), Acer Aspire TimelineU M3-581TG (i7, GT 640M, 4/70 W), Acer Aspire TimelineUltra M5-581TG (i5, GT 640M, 9/69 W), HP Envy m6-1101sg (i5, HD 7670M, 9/48 W). Due to the lack of a discrete GPU, the U510 draws a maximum of 27 W during the stress test. 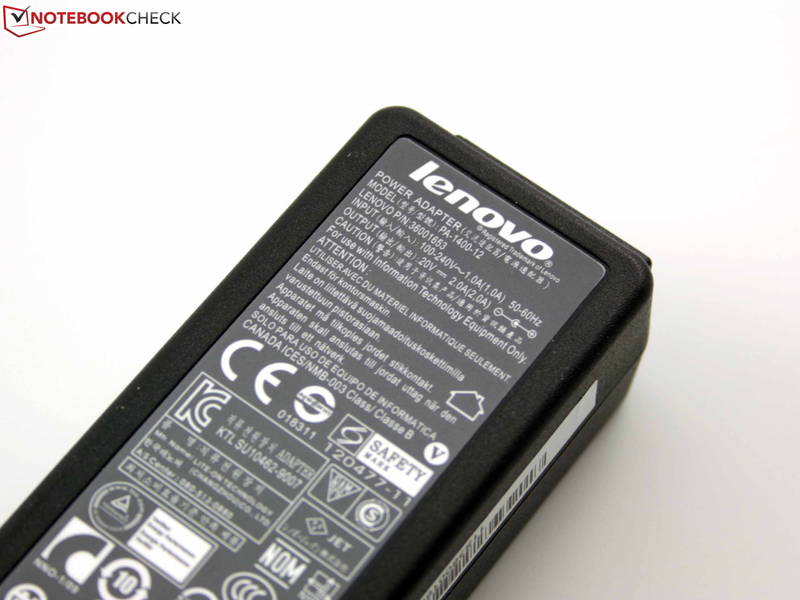 Our Lenovo is not an extreme energy saver, despite the weak processor. Optimus and Intel's energy-saving functions (CPU) provide even the powerful rivals with high energy efficiency. Our stress test (Prime95, FurMark) shows the highest possible power consumption. The small 65 W power supply seems somewhat excessive. However, we have to take into account charging the battery as well as the other configurations with Core i5/i7 and GT 620M. The WLAN test (a script reloads web pages, 150 cd/m² brightness dimmed at 3 levels) finished after 4:47 hours. This test is more realistic than the idle one, because at an acceptable for indoor use brightness, text was scrolled up and down and video clips were played. The rivals do not perform much better (Idle/WLAN): Asus S56CM (44 Wh, 3:28/2:35), Acer Aspire TimelineU M3-581TG (54 Wh, 11:39/6:04), Acer Aspire TimelineUltra M5-581TG (54 Wh, 11:12/5:05), HP Envy m6-1101sg (62 Wh, 6:40/4:55). Those seeking a long battery life should not immediately buy the S56CM, but rather the Aspire model, which also delivers the best graphics performance. The customer cannot get around the glossy display among these rivals. 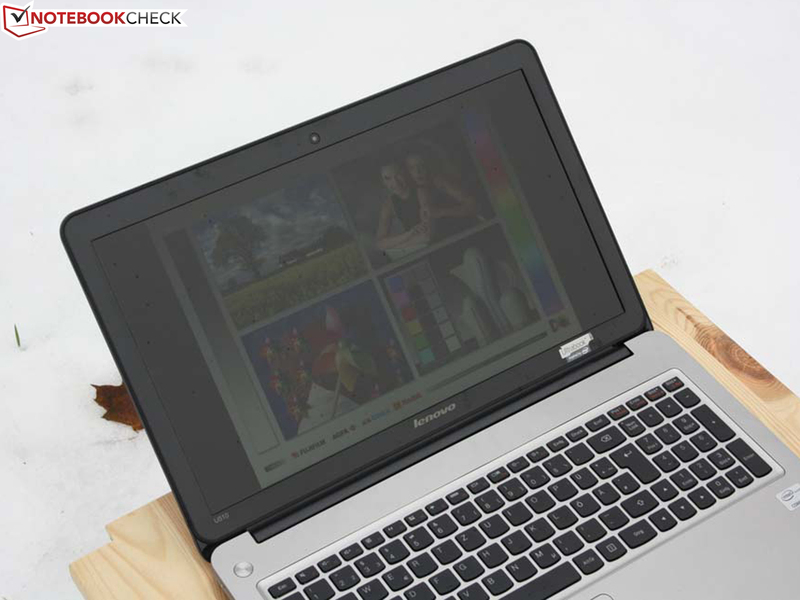 Lenovo's IdeaPad U510 (Model MBM62GE with Core i3-3217U) tries to be two things at once. 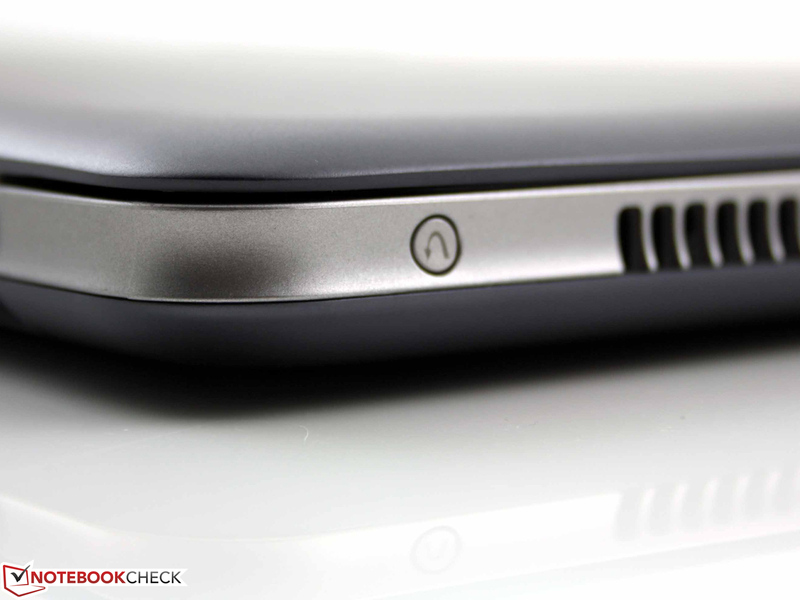 On one hand it is an affordable entry-level ultrabook. On the other it tries not to skimp on workmanship in order not to look like a plastic brick. Several points of the plan have been a success. The interfaces, including the mini-VGA port and optical drive, correspond to the standard 15-inch notebook. 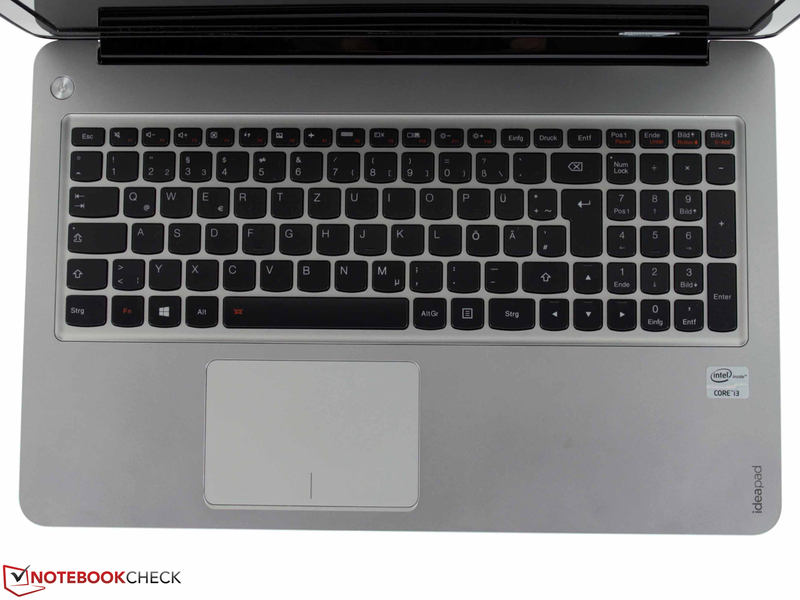 Workmanship is an important point for Lenovo, because the notebook looks very much like the MacBook Pro. Had the manufacturer omitted the numeric keypad, going to court would have been inevitable. Not much should be expected of the strength of an aluminum unibody for 700 Euros (~$930). The material feels of high quality, but the bendable base and the weak display lid prove that it only looks that way. Still, Lenovo has put some effort into it and the workmanship is adequate for this price range. Unfortunately the same cannot be said about the keyboard. It gives in when typing. The keys have a vague pressure point and a short stroke. The touchpad is not much better either. The high level of pressure needed to register a click is tiresome and the short key drop is annoying. Speaking of weak points: the glossy display and its low luminance hinder outdoor use. On the other hand, the contrast ratio of 611:1 is good and the colors are crisp and clear. There is no room for criticism in terms of performance, excessive heat, and noise level. For 700 Euros (~$930) the user receives sufficient power, as can be expected from a low-voltage Core i3. Gaming performance is nonexistent on our unit. The i5 and i7 models are equipped with a GeForce GT 620M. 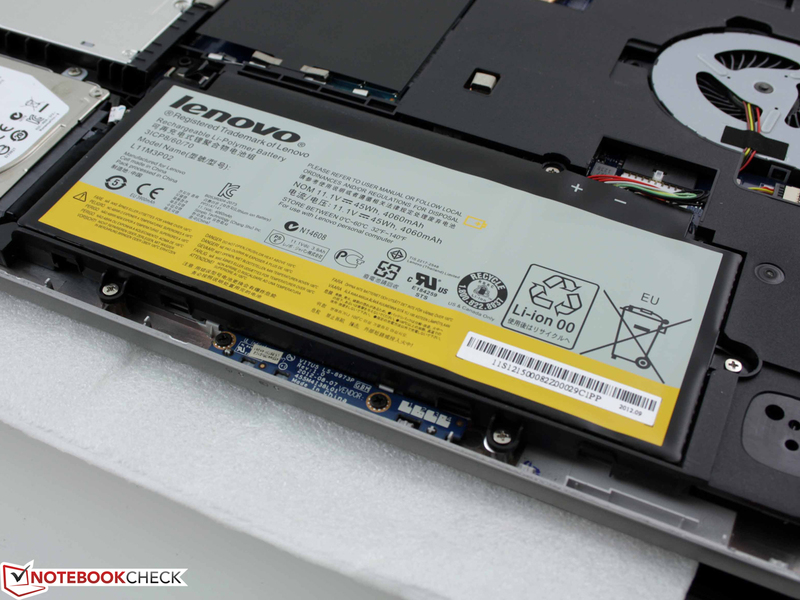 Lenovo will shortly start delivering the U510 with the successor GT 720M. The fiercest rival is definitely Asus S56CM (680 Euros/~$903), which is cheaper and comes with an i5 and GT 635M. It has more gaming power, but shorter battery life. Acer's Aspire TimelineUltra M5-581TG is not cheaper with an equivalent CPU. But the longer battery life, better keyboard (backlit), and good workmanship bring value for money. 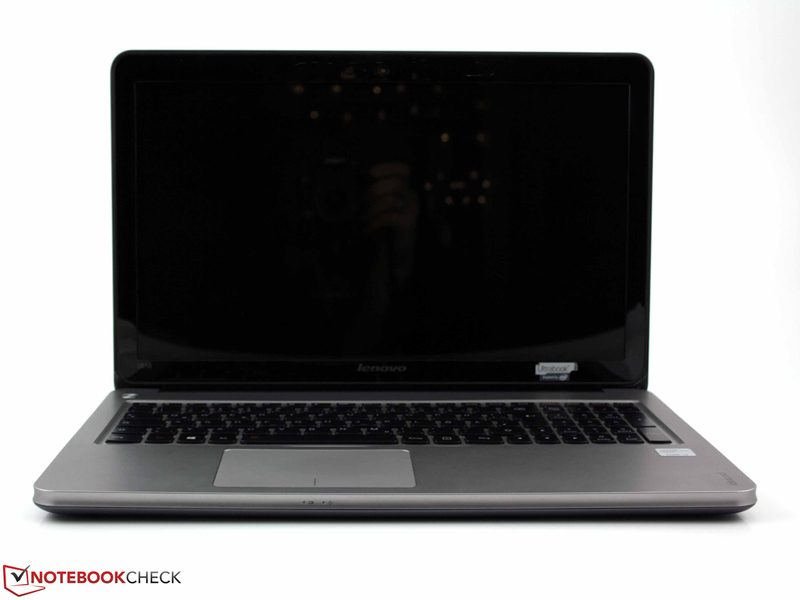 Lenovo IdeaPad U510: elegant look and distinctive weaknesses. 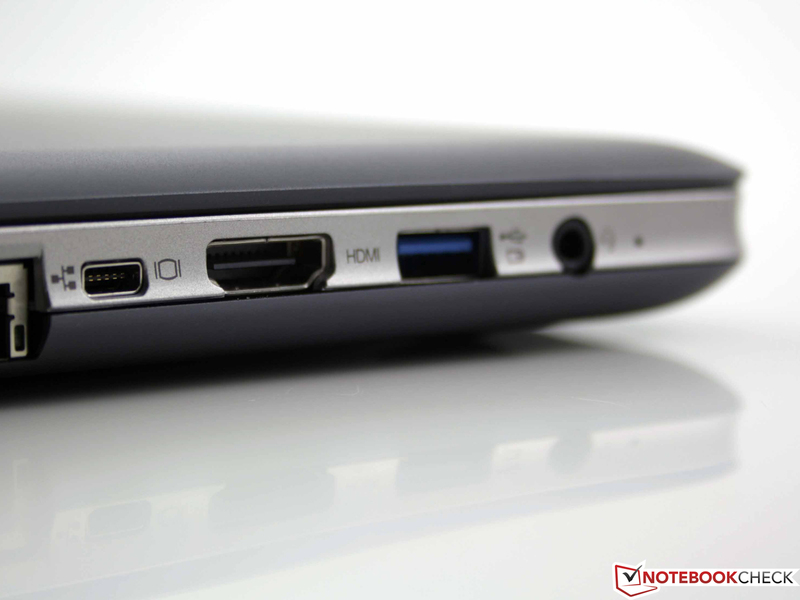 IdeaPad U510: the affordable Windows 8 ultrabook? The hard drive is combined with a small SanDisk U100 SSD with 24 GB capacity. The user cannot use the storage of the mSATA module. The system uses it as a cache. The speakers are installed on a movable rubber mount. 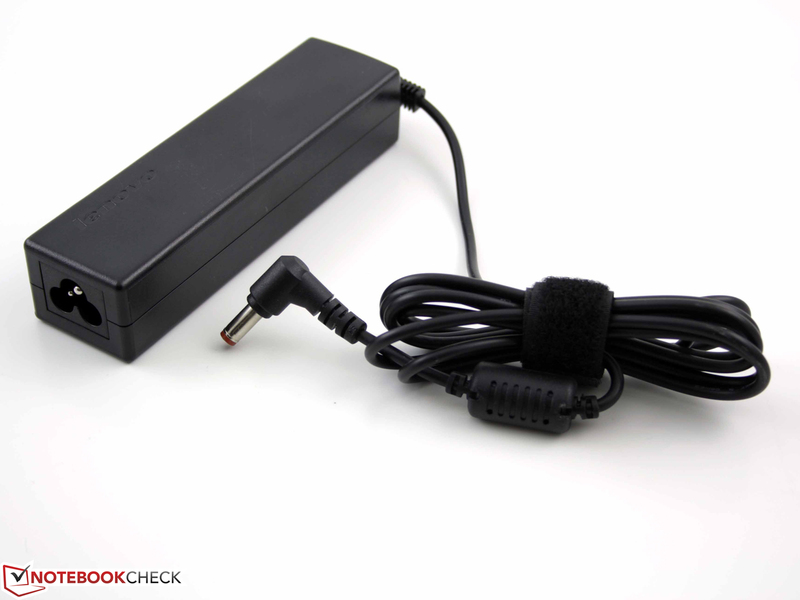 The 350-gram 65 W power supply is enough for the full load power consumption. The bar shape makes it handy. The power supply delivers more energy and the notebook draws. This is the place of the GeForce GT 625M in the more expensive models. 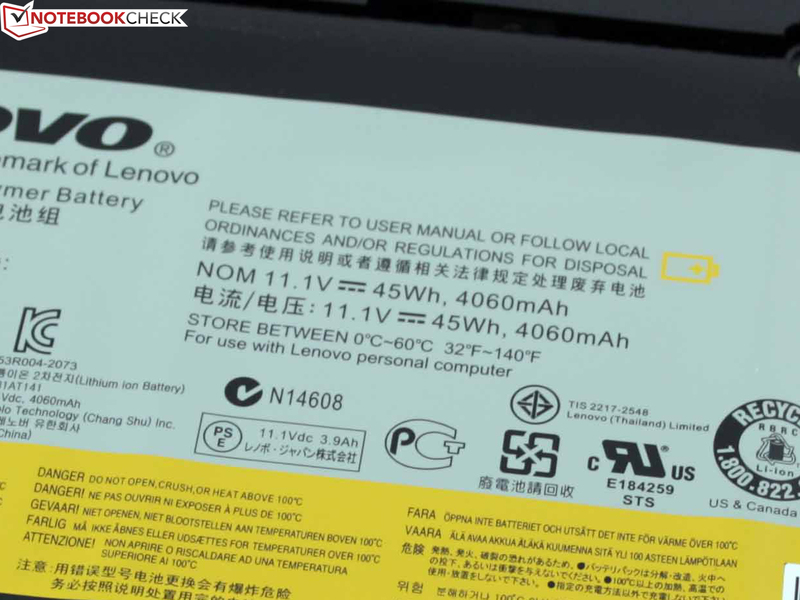 The battery has a capacity of 45 Wh. This provides run times of four to five hours. But the reflective and not very bright display hinders outdoor use. A pamphlet explains the warranty extensions available for the U510. 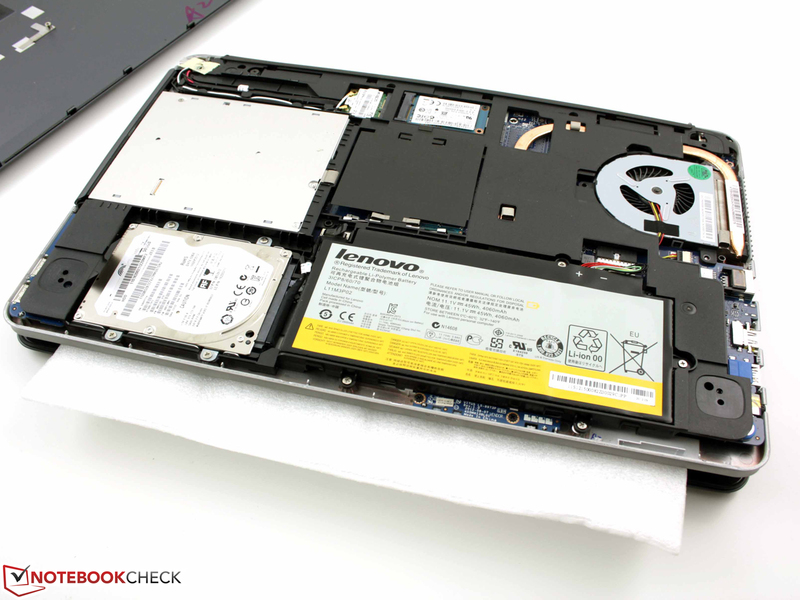 Lenovo IdeaPad U510: extremely quiet fan and low temperatures. 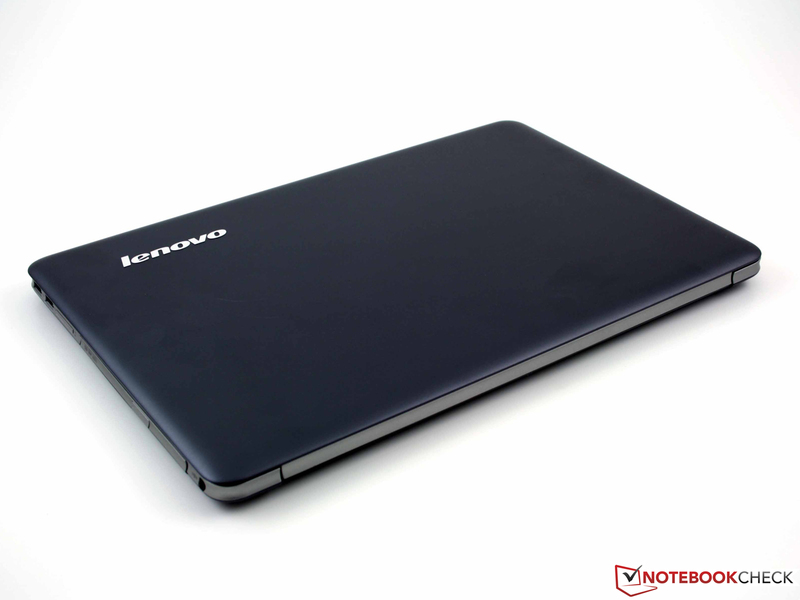 Lenovo IdeaPad U510: the cool aluminium surface is pleasant. The base unit is very stable. 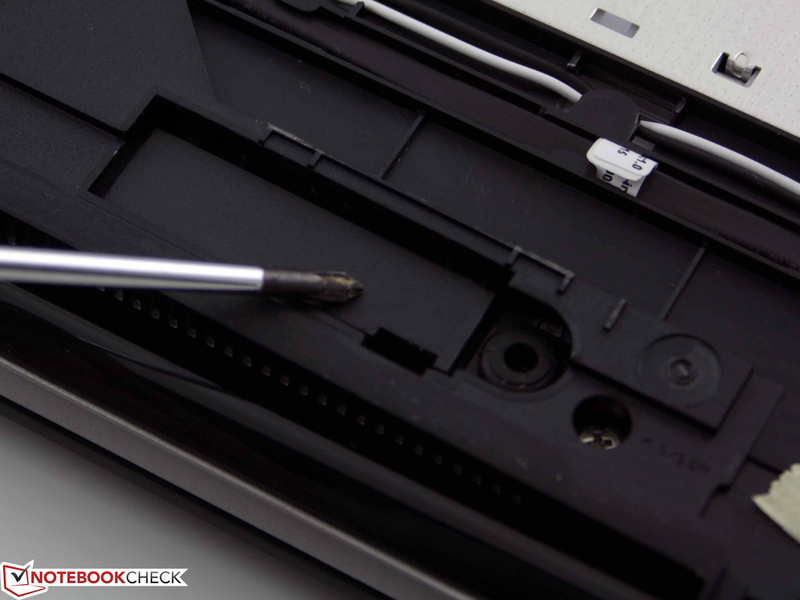 Before the bottom cover can come off, four screws below the keyboard must be removed. removing the keyboard can quickly lead to scratches. 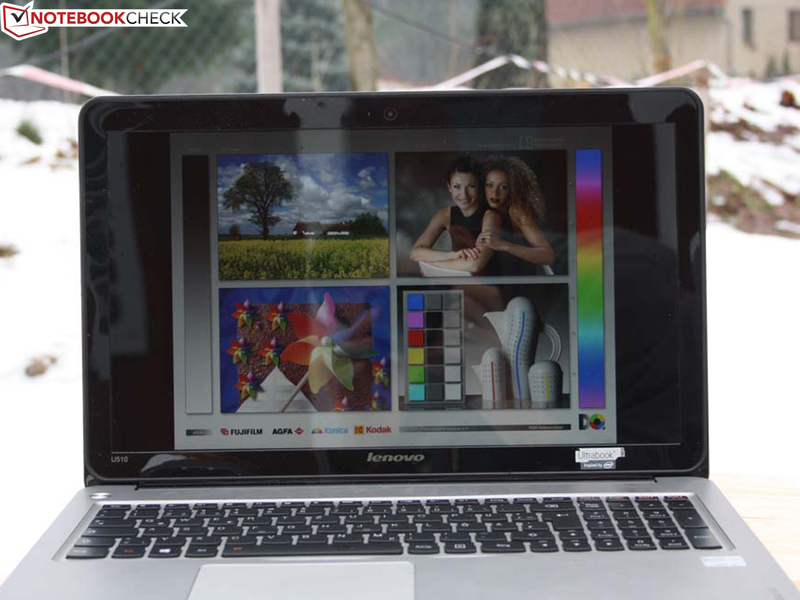 Lenovo sells the largest model of the IdeaPad U family for 700 Euros. who want an ultrabook at a lower price. One should not complain about the height. Intel's 22 mm specification has been met. Lenovo advertises 21 mm, but counting the feet the height is 24 mm in total. The aluminium display and bottom covers ensure a premium look. However, the plates do not provide much in terms of strength. The keyboard bed gives in on several places when typing. 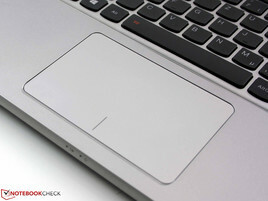 The edge below the touchpad can pressed. The case has no maintenance cover, but opening it is still possible. Lenovo IdeaPad U510: the keyboard is disappointing, the key stop is boncy. The workmanship is mostly successful, but far from perfect. 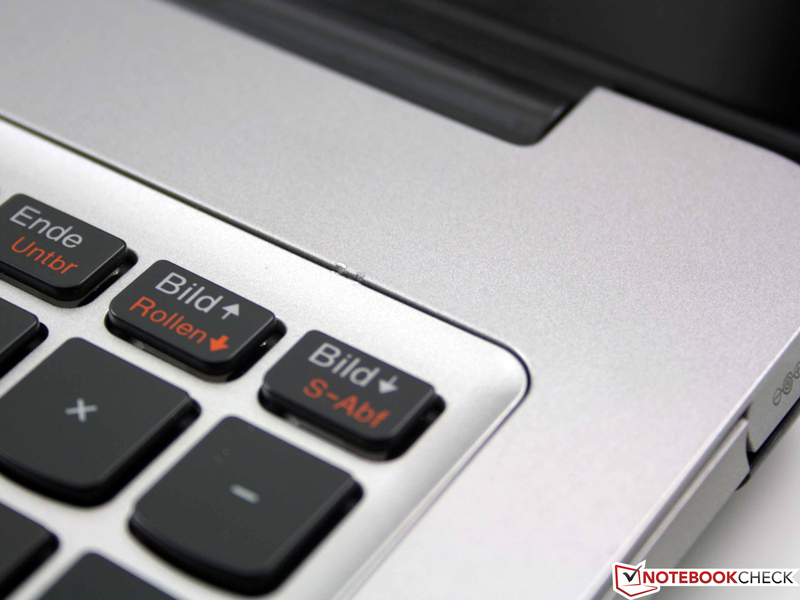 An ultrabook aimed at the office user, but with better input devices. The bold claim that this is an ultrabook. The height and weight requirements were clearly missed (Intel requires 22 mm and 1.4 kg). Otherwise a great contrast that is a surprise in this price range. Notebooks with an aluminium elegance and low weight: Asus S56CM (i7, GT 635M), Aspire TimelineU M3-581TG (i5, GT 640M), Aspire TimelineUltra M5-581TG (i5, GT 640M), HP Envy m6-1101sg (i5, HD 7670M). And one without a DVD drive: Asus VivoBook S400CA (i5, Touchscreen). The lowest priced 14- and 15-inch (with DVD drive) notebooks are Acer Aspire V5-431 (from 400 Euros), V5-571PG (680 Euros) und Medion Akoya S4216 (600 Euros).